VFP was founded in 1985 by 10 U.S. veterans in response to the global nuclear arms race and U.S. military interventions in Central America. It grew to more than 8,000 members in the buildup to the U.S. invasion of Iraq in 2003 with veteran and associate members in every U.S. state and several countries, with more than 120 chapters across the nation. 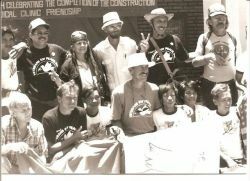 In the last 26 years, VFP has led or participated in over 50 peace delegations to Latin America, Europe, the Middle East, Asia, and Africa. We have collaborated with dozens of organizations and sponsored 1000’s of activities promoting peace in this country. We initiated the very successful weekly Arlington West Memorial at the Santa Monica Pier. Similar public displays to honor those killed in war have been replicated across the country. VFP has sponsored over a dozen major projects to heal the wounds of war, among them the Iraq Water Project (11 years) and Children of War Rescue Project which met the medical needs of more than 100 children during the Bosnian conflict. VFP holds a permanent Non-Governmental Organization seat at the United Nations. It is also the first military veterans’ organization invited to be a member of the International Peace Bureau based in Geneva, Switzerland. Today, members remain actively engaged in campaigns to help bring about a clearer understanding of the cost of war, in particular our occupations of Iraq and Afghanistan, to bring clean water to Iraq, to support veterans of the Iraq war, to close the School of the Americas and to counter military recruitment efforts in schools.